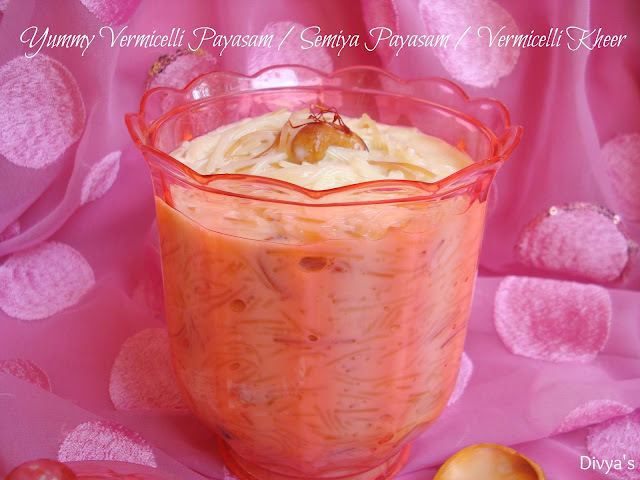 Vermicelli kheer / Semiya payasam, prepared using condensed milk is the yummiest kheer. This is a rich and yummy Indian dessert variety prepared during festivals and celebrations, It is prepared using milk, ghee and sugar, I love it so much and am sure that it must be everyone's favorite too. The creamy texture of the kheer with ghee aroma just attracts anyone, even people who don't have a sweet tooth. 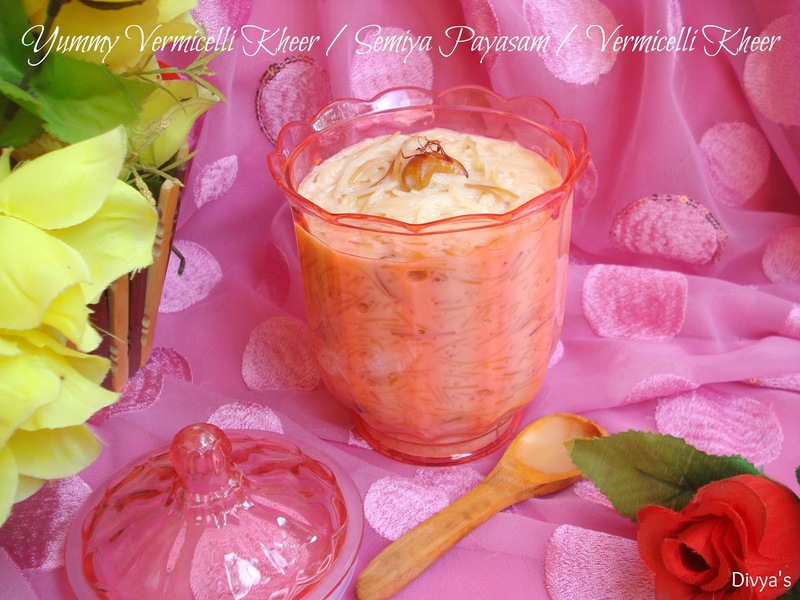 Check out my other kheer hit, moong dal payasam / Paasi paruppu payasam click here. 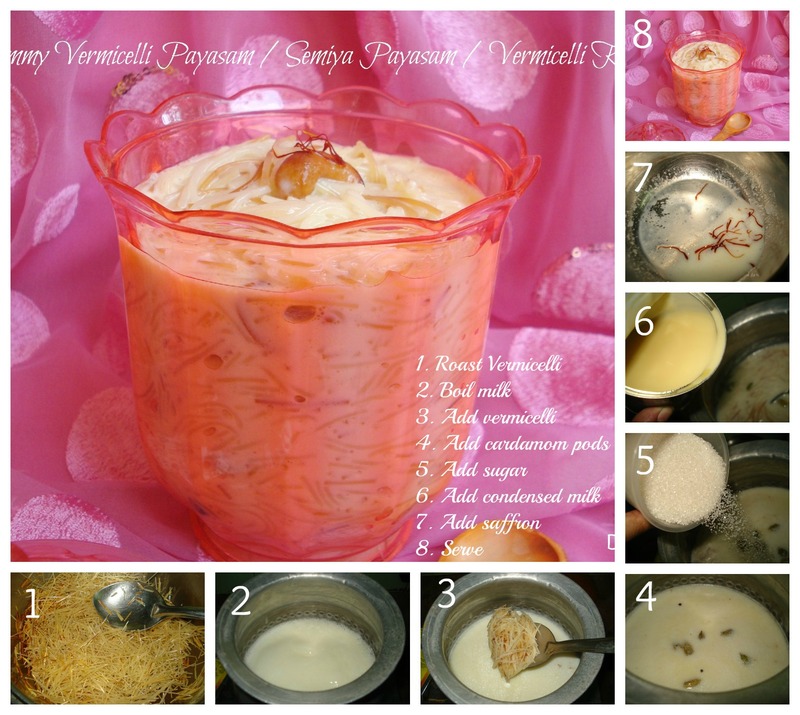 Follow this procedure to get a very delicious payasam and this will be a massive hit in your homes. Heat a wok/pan and add 2 spoons of ghee to it. Roast the vermicelli (break them into smaller pieces if they are long) until it turns slightly brownish. Remove from pan and let it cool. In a tadka pan/any pan add 4 spoons of ghee and roast cashews until it turns slightly brown then add raisins and saute till it puffs up. Set aside. Now take a pot/sauce pan and add boiled milk (I used aavin milk) and equal amount of water (i.e. 500 ml) to it. (If it is raw milk boil it well until the raw smell leaves, use boiled milk preferably). Boil well on low flame until it reduces to 3/4th of its original volume. Now add the roasted vermicelli to milk in the saucepan and stir well. Then after 2 minutes add crushed cardamom pods and stir well. Now add sugar and stir well. Check whether the vermicelli is cooked then add condensed milk and stir well. 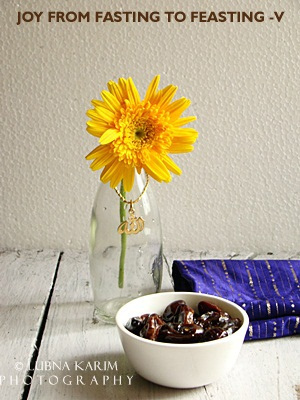 Then add the roasted cashews and raisins to the kheer and stir well. Remove from flame and add the saffron mix to the kheer. TIP 1: Add chopped almonds along with cashews if you wish. TIP 2: You can add more milk and less water if you like it more rich but this ratio itself is rich enough. TIP 3: Reduce the amount of sugar if you wish. If it seems too sweet add some more milk or water and alter the sweetness according to your taste. TIP 4: Condensed milk enhances the flavor but if you do not wish to use it, then add milk and water in the following ratio; milk:water (750 ml : 250 ml). TIP 5: Do not burn/over-roast vermicelli. 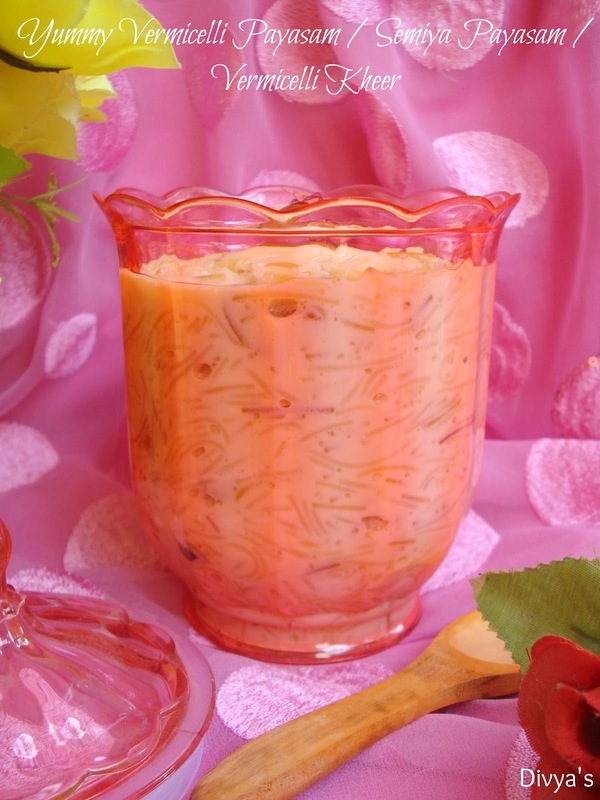 If you do not roast vermicelli it will become more sticky, but roasting will make the vermicelli non-sticky, hence the kheer consistency will be good. If you get ready-made roasted vermicelli it would be better. 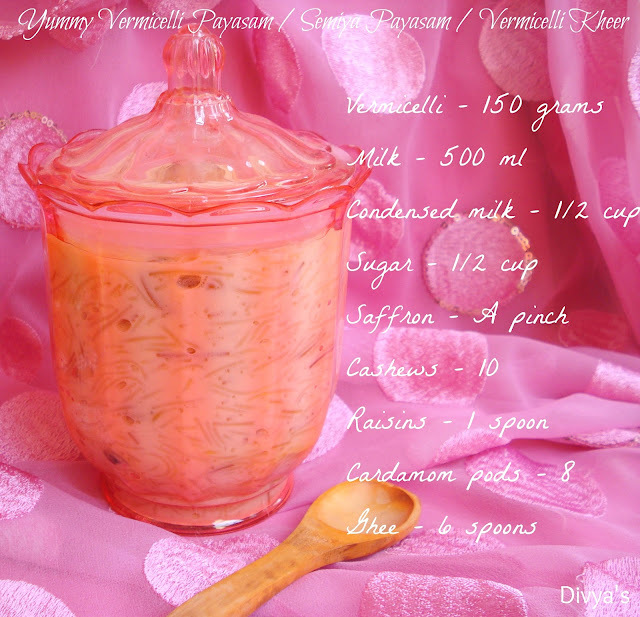 TIP 6: Add two drops of vanilla essence if you like its flavor. This will enhance aroma and flavor too. Yummy, lip-smacking, creamy Vermicelli Kheer / Semiya Payasam is now ready!! Serve warm (preferably) or chilled!!! Am sure you will love this delightful dessert!! also to Lubna's "Joy from fasting to feasting event"
and Priya snd Jagruti's Olympic game event. would like to taste it right now :) excellent preparation.. I guess you are not a big fan of creamy desserts..right?? Then you can reduce the addition of milk here :) Thanks Meenu!! Loved ur pics....yummy and delicious kheer.. I love pink too :) Thank you so much!! 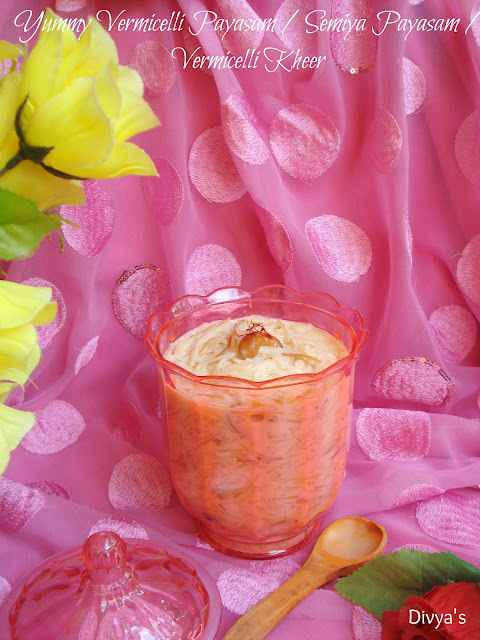 Love the bright pink colour kheer. It is my fav one. 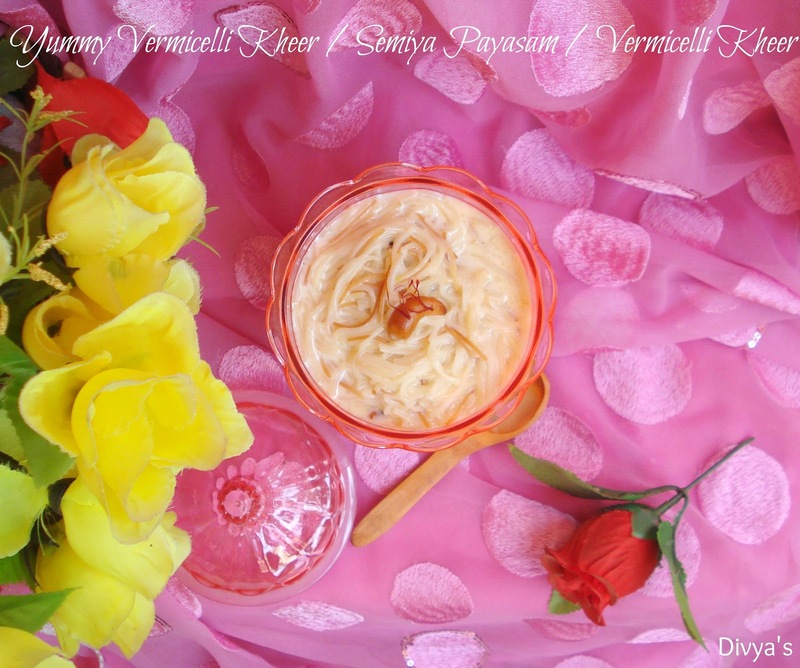 creamy kheer and cute presentation...lovely! Rich and delicious Kheer.. Neat Presentation. Such a rich and delicious dessert. I was craving for something sweet for a few days, but not able to decide what should I make. You gave me the idea...why? 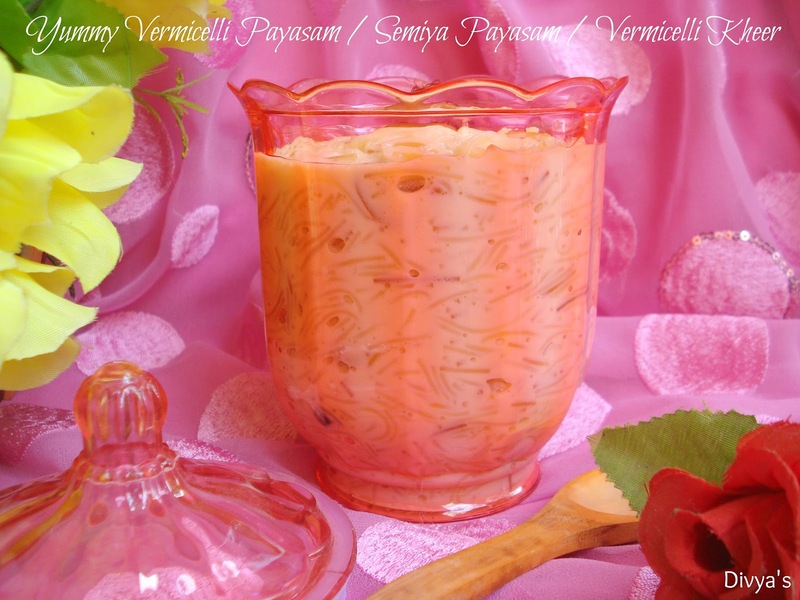 Payasam, indeed! The pink background looks majestic! Perfect texture and nice presentation...keep it up. 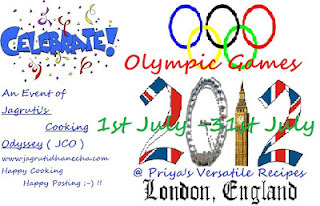 Hi divya, Collect your award from my space @ "http://jopreet.blogspot.in/2012/08/my-13th-award.html"
nice presentation and looks yum !